With so many options in both sweet and savory versions, it's hard to judge what the best recipe for baked brie is. Whichever you prefer, baked brie is a lovely addition to an appetizer or dessert buffet table as it pairs well with different wines and cocktails. 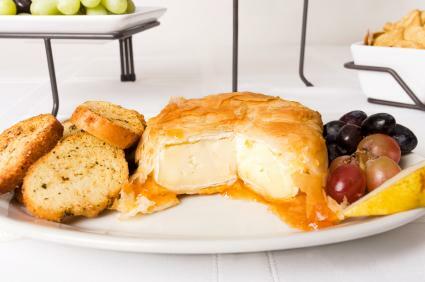 Some baked brie recipes include encasing the cheese in puff pastry before baking, while others require placing it in a shallow dish with no crust. Besides making a more dramatic presentation than plain baked brie, crusted baked brie adds a crunchy exterior and highlights the creaminess of the melted cheese. However, you may prefer to bake your brie plain, and then add toppings to accentuate your meal, or add texture to your dish. Although the majority of baked brie recipes are sweet and generally served as a dessert course, with just a few simple ingredients, a wheel of brie is transformable into a tasty appetizer. All you need as an accompaniment is a freshly baked baguette or loaf of crusty ciabatta bread. Place your oven rack in the middle of the oven, and preheat the oven to 400F degrees. Lightly spray a glass pie plate or shallow baking dish with cooking spray. Using the sharpest knife available without a serrated edge, carefully carve the top rind from the top of the cheese wheel only. Do not cut into the sides of the rinds, as the rind serves as a wall to keep the cheese from running into the dish when it is heated. Place the wheel of brie into the oiled dish, cut side up. Mix the garlic, rosemary, zest and olive oil together. Dribble the topping evenly over the top of the cheese and lightly sprinkle the cheese with salt. Bake until melted and bubbling, between 20 and 30 minutes. Let cool for about five to ten minutes before serving, to prevent the cheese from spewing into the pan. The puff pastry crust makes a fabulous dessert presentation. In France, this dish is called Brie en Croûte. With the rack in the center of the oven, preheat it to 425F degrees. Spray a flat baking pan or cookie sheet with cooking spray. Lightly roll out the pastry dough to make it uniform and eliminate any holes or tears. Take care not to over-handle the pastry, as it will start to fall apart. Place the cheese atop the pastry sheet with the rind intact. Spread the cranberry topping evenly on the surface of the brie and sprinkle with the toasted almonds. Gather the pastry up like a package and carefully twist the top to seal the enclosure. Tie the top with a piece of cooking twine twice for a whimsical touch, and place the cheese on the prepared pan. Whisk together the yolk and cream and brush all over the pastry to give the finished dish a shiny appearance. Bake the cheese for around 25 minutes, until the pastry puffs and turns light brown. Let the brie cool on the pan for about five minutes before transferring to a serving plate. Serve with crackers or toast rounds made from French bread. Mix together wine, vinegar, brown sugar, figs, rosemary sprig and pepper in a small saucepan made of non-reactive material safe for acidic ingredients. Bring the mixture to a boil over medium to medium-high heat, continually stirring to prevent sticking. Reduce temperature and simmer for about 10 minutes until the sauce thickens and reduces. Discard the rosemary sprig and stir in the sugar and cranberries. Simmer over medium heat until the cranberries burst and the sauce is thick, between 10 and 20 minutes depending on desired consistency. Chill the sauce in a covered dish until you're ready to serve it. Mask the baked brie with the sauce or serve it on the side. Sweet or savory, baked brie is easy to make and a little goes a long way, so it's a fancy, yet economical dish. Experiment with different toppings that suit your tastes, and the next time someone queries, "What is the best recipe for baked brie?" share your favorite recipe.